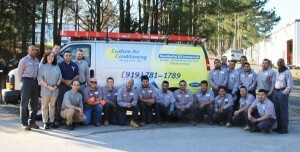 At Custom Air Conditioning of Raleigh NC, our replacement department is ready to serve your needs the simple way! This may be one of the harder aspects of HVAC. After all, it’s a complicated task to pick the perfect equipment for your needs and financial abilities. Our team can come out to your home and inspect your heating, ventilating and air conditioning systems. They will inspect your current HVAC equipment and supply you with an estimate. These estimates are outlined with several different options in both size of equipment and cost, including brand names and model numbers. You are able to then research the equipment at your own leisure. All estimates are free of charge and are honored for 90 days. This gives our customers the opportunity to plan for their replacement.